Prepared by Clement Kent, Godel Computer Solutions Ltd, for the 2000 J Users Conference - this web presentation is an excerpt from the material shown at the conference. Copyright 2001 Clement Kent. Permission is given to quote this material in non-profit publications so long as credit is given to the author. Thanks are given to the Ontario Ministry of the Environment, the US Environmental Protection Agency, the Ontario Medical Association, Greater Boston Physicians for Social Responsibility, Prof. M. O. Andreae, Max Planck Institute for Chemistry, and The UK National Air Quality Information Archive for information and texts copied from their web sites. Copyright to those materials remain with the original authors. 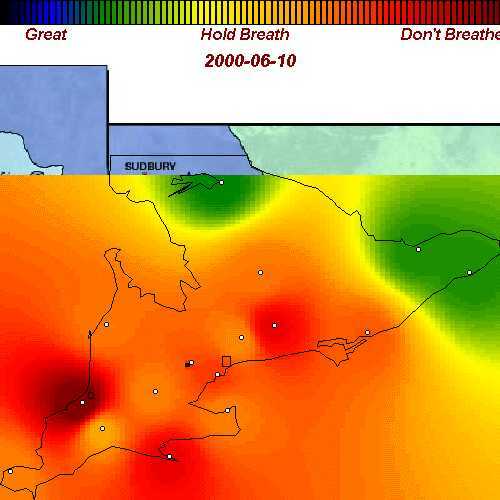 Ground-level ozone is one of the damaging components of smog. Smog levels have risen in most of North America east of the Mississippi and south of the boreal forest to levels previously associated with smog basins such as Los Angeles. Ground-level ozone measurements are now available on the Web for both Ontario and the United States.